It seems the “Mobile Audio App world” is dominated by iOS devices from Apple and the vast majority of Pro Audio software and hardware developers have stuck to this platform and are unwilling to spread their wings into Android and Windows Phone territory……Until Now…..
IK Multimedia have recently announced their move into the Android world which is a very welcome sight to those not interested in entering the Apple lifestyle. Their first App the iRig Recorder is pitched as a “Field Recorder App” with fairly straightforward functionality but none the less will pave the way for their other products to move over to Andoid in the future. 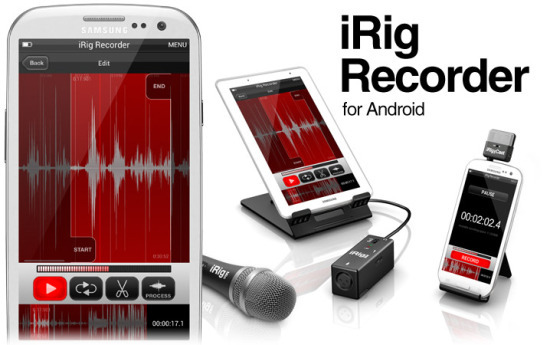 IK Multimedia, the leading developer of mobile music apps and accessories, combined with the announcement of its first recording Android app, iRig® Recorder, is proud to announce that five of its popular iOS mobile accessories are compatible with the most popular Android devices. All its range of microphones and recording accessories including iRig MIC, iRig MIC Cast, iRig PRE, plus the portable DJ mixer iRig MIX and the tabletop stand iKlip STUDIO, can now be used with the most popular Android smartphones and tablets, such as the Samsung® Galaxy and Note range. iRig MIC is a quality, handheld microphone that’s designed for close-range and distance-miking applications. It’s great for vocal recording and other musical applications, as well as podcasts, lectures, and more, and it enables better quality recordings than can be obtained with a mobile device’s built-in mic. iRig MIC Cast is a small, high-quality microphone designed for podcasts and other voice recordings. It attaches to a smartphone or tablet via its audio jack, features a mini-headphone jack for monitoring, and offers a low-profile solution for capturing better sounding audio from a smartphone or tablet. iRig PRE is a pocket-sized mic preamp that makes it possible to use professional XLR mics with a mobile device. It provides phantom power for condenser mics, and has an adjustable gain control for setting the most favorable input level. All the above products work great in tandem with the just announced iRig Recorderfor Android, the easy-to-use recording and editing IK Multimedia app. iRig MIX is the ultra-portable DJ-style audio mixer that’s small enough to hold in one hand, and is perfect as a hardware front end for mobile DJ apps. Its two channels each have a volume slider, EQ controls and LED meters, plus a crossfader adjusts the level between the channels. It offers plenty of I/O including RCA outputs, which are great for connecting to DJ gear and home stereo setups. iKlip STUDIO is a solidly built tabletop stand for tablets designed for use on flat surfaces with music or other type of apps. It securely holds a tablet in place with nonslip rubber grip feet, and features durable thermoplastic components, an adjustable viewing angle, and the ability to fold up for easy storage and transport. iRig MIC, iRig MIC Cast, iRig PRE, and iRig MIX are already available from authorized IK Multimedia music and electronics retailers worldwide, and from the IK Multimedia Online Store, with prices ranging between $39.99 and $99.99 (€29.99 to €74.99, ex. taxes). iKlip STUDIO for 10” tablets is also already available while the 7” tablets version will ship during the first quarter of 2013, and will be priced at $29.99 / €24.99 (ex. taxes).